Merlin and Nancy Molstad purchased this pink Evergleam aluminum Christmas tree around 1966 when they began operating Nelson Flag & Display Service in La Crosse, Wisconsin. As a retail outlet for Evergleam products, their store featured this tree, with its distinctive presence, as a storefront display model. The Molstads also sold color light wheels, matching ornaments, and other Evergleam accessories. In December 1958, Tom Gannon, toy sales manager for the Aluminum Specialty Company of Manitowoc, Wisconsin, first noticed a metal Christmas tree displayed in a Chicago Ben Franklin store. 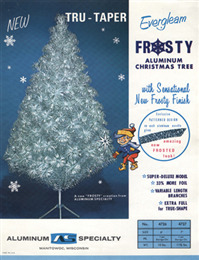 Modern Coatings, Inc. of Chicago made the tree, but it was too expensive and bulky for a mass market. Gannon took the original tree back to Specialty where engineer Richard Thomsen led the effort to produce a better, cheaper version for display at the American Toy Fair in March 1959. Thomsen's team succeeded and their tree was well received by buyers. On a hunch, Specialty produced hundreds of thousands of trees in time for the 1959 holiday season and their gamble paid off as sales soared. Since Modern Coatings had patented both the easy-to-use paper tube for storing branches and the drill-hole angle, allowing for branches of uniform length, and Aluminum Specialty had greater aluminum manufacturing expertise and access to national markets, the two companies decided to enter into a licensing agreement. Aluminum Specialty produced the Evergleam brand tree, by far the most popular brand of aluminum trees in a crowded marketplace. Coming in a variety of sizes and colors, more than one million Evergleams found their way into American homes during the 1960s. The massive appeal of aluminum trees derived from their novelty in a marketplace dominated by traditional holiday decorations and designs. The new materials offered a modern, clean look, but Aluminum Specialty never advertised their trees as "artificial." Instead, the company promoted a simple, easy-to-use decoration that differed strikingly from its competition. After a successful first year, Aluminum Specialty began year-round tree production, sometimes requiring three shifts per day. 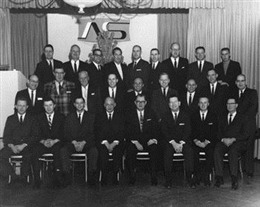 Sales peaked in 1964-1965, and throughout the 1960s the company's Evergleam brand enjoyed a 60-65 percent market share in the United States and Canada. Primary outlets included both regional stores and national chains such as Montgomery Ward, Ben Franklin, and Woolworths. 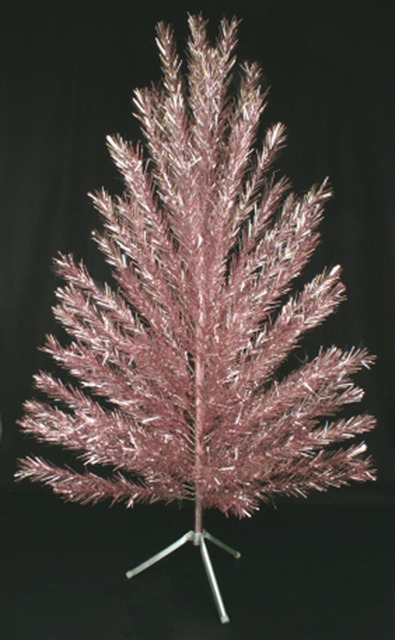 While approximately 75-80 percent of all Evergleams came in silver, Specialty also produced trees in other colors with pink being one of the rarest varieties. Aluminum trees quickly found their place in contemporary popular culture and soon attracted the attention of critics who proclaimed them symbols of the commercialism of Christmas. In the television special A Charlie Brown Christmas (1965), Lucy wanted "the biggest aluminum tree [Charlie Brown] could find, maybe even painted pink." Charlie ultimately selected a real, but skimpy tree because it better reflected his view of the true spirit of Christmas. After Aluminum Specialty stopped making the trees in the early 1970s, many of these trees remained essential to family Christmas traditions while others were relegated to garages and attics. Although the Evergleam aluminum Christmas tree has fallen in and out of favor since its debut in 1959, today there is a renewed popular interest in this strikingly different holiday tradition. Ironically, many people today find aluminum trees compelling because they conjure up warm, nostalgic memories or conceptions of Christmases past. Others are attracted to the trees because of their space-age qualities or campy appearance. Regardless of the reason, the aluminum Christmas tree has managed to endure changing tastes and times. Discover more historical information about the Evergleam Christmas trees in this Milwaukee Public Radio interview. December 13, 2013.